It looks like voters in Michigan have passed a ballot measure that will loosen the state’s restrictions on embryonic stem cell research. Proposal 2 would amend the state constitution so that infertility patients in Michigan could donate their extra embryos for stem cell research, provided that the embryos would otherwise be discarded. 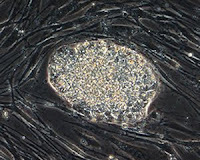 Deriving stem cell lines from embryos (which destroys the embryo) is legal under federal law, but a state law in Michigan prohibited the destruction of embryos in most cases. According to the University of Michigan, the state was one of the most restrictive in the country with regard to embryonic stem cell research.